Removing the need to keep a full blown computer connected to your 3D printer while printing has been an enticing goal since the start of desktop 3D printing. We have seen multiple methods employed to help with this issue: SD Cards with LCD interfaces, built in memory to queue prints up in, and USB sticks have all been popular. Previously we discussed the usage of OctoPrint in conjunction with the RaspberryPi as a solution for network attached printing. 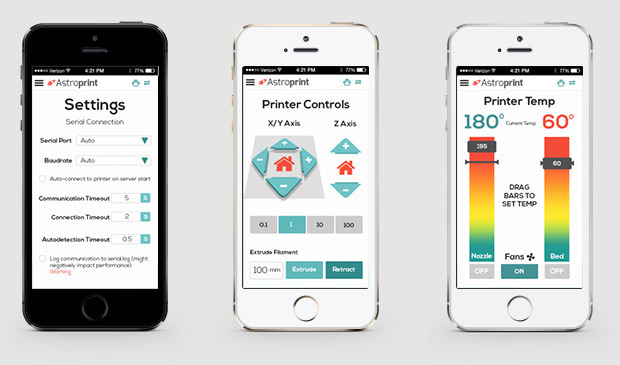 Now a new project, AstroPrint, aims to rocket our printers into new heights of ease and usefulness. The AstroPrint team is part of the current crop of startups working to build their products at BetaSpring, Providence’s startup incubator. I stopped by last week to talk with the team and take a look at the project. AstroPrint is based off of the much loved by our group OctoPrint distribution but heavily modified for a cleaner more simplified interface. They have also replaced the RaspberryPi with the more powerful PCDuino which sports built in wifi making networking greatly simplified. To round out the package they also include a cloud component capable of slicing your models without the need for you to pre-slice on your own hardware. The result of all of this work is a system that allows you to browse for models, slice them, and control your printer from your smartphone or tablet without the need for a computer. I was pleased to see how far along with the system they are and was able to see a full working demo of the system. Over the next few months the team hopes to add in a few more features and work on scaling the system for the large number of users it will need to handle when it goes live. The team who hale from California only have a few more weeks left here in Rhode Island and hopefully we will get a further peak before they head home. 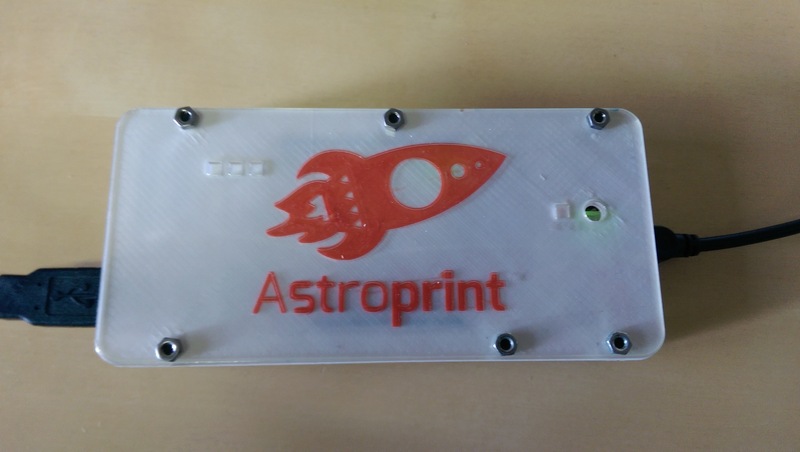 AstroPrint was launched live on Kickstarter a few weeks ago and fully funded in the first day. Any kickstarter backer who purchases a kit will also receive a lifetime free Pro membership to their cloud component. You can explore and hopefully consider backing their kickstarter campaign here. More photos and video after the break.